Spread the word and get $15 for every friend you refer! How many people do you know that would love us too? Refer a friend to IGL and they get their first month free and YOU earn a $15 credit on your monthly bill. There is NO limit on the number of friends you can refer during the promotion! **Valid for new customers only. 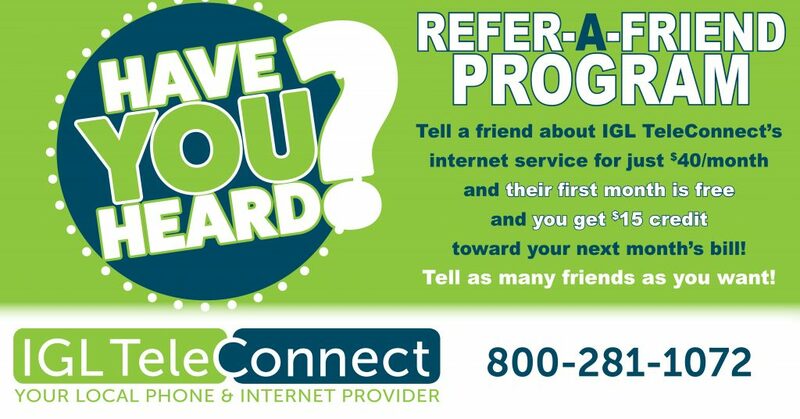 New customers must sign up by calling IGL TeleConnect directly at 800-281-1072. New customer must give the referrer’s name or account number at sign-up. Not valid at authorized retail locations. New customer will receive a credit for one month of service on their first bill. Existing IGL customers must have an active account at the time of referred new customer's installation. Existing IGL customers who refer friends will receive a $15 credit for each new customer referred and activated, payable on the next monthly bill following the new referred customer(s) activation date(s). Promotional bill credits do not apply to applicable taxes or required regulatory fees, and are not redeemable for cash.